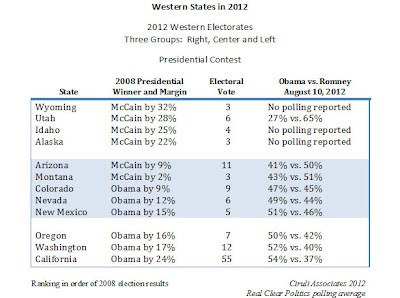 Barack Obama has a lock on the 2012 Hispanic vote nationally and in Colorado. Repeated polls show 2-to-1 support for Obama over Mitt Romney. Obama’s concern must be turning out Hispanic voters, who are often underrepresented in registration and on Election Day. National polls confirm Romney’s disadvantage with Hispanic voters as he enters the final two months of the campaign. Some of his operatives have been quoted as having a goal of 38 percent of the Hispanic vote. That is highly unlikely. John McCain only received 32 percent in 2008, and he was seen as having a pro-Hispanic immigration policy. NBC/Wall Street Journal (8-23-12): Obama – Hispanics: 63% to 28%; Romney – Anglos: 53% to 40%. Romney’s goal of 38% (very unlikely). John McCain received 32% in 2008; George. W. Bush won 40% in 2004. A recent study states that Hispanic voters will likely make up 8 percent of all voters in toss-up states on November 6. That figure is low for Colorado, where Hispanic voters made up 12 percent of the Colorado electorate in the 2008 presidential election. The recent PPP Colorado poll said 13 percent of its sample was Hispanics and the New York Times/CBS/Quinnipiac poll showed 9 percent of voters were Hispanic. As the presidential party conventions pass the halfway mark and the campaigns enter their final two months, Americans are at record levels of dissatisfaction. Less than one-quarter of Americans are “satisfied with the way things are going in the United States at this time.” And, while the level of dissatisfaction varies by party, even Democrats are 2-to-1 dissatisfied. Much of the dissatisfaction is aimed at the federal government and is affecting the election. Only 10 percent of Americans approve how Congress is handling its job. Record lows accompany major turnovers in congressional elections in 1994, 2006, 2008 and 2010 (below 20 percent). Democrats (9%), independents (11%) and Republicans (10%) are in agreement Congress’ performance is inadequate. But, it is not clear there will be a sweep of the Republican House majority. Because anger appears to be generalized and bi-partisan, it is possible individuals in both parties are vulnerable and neither party will receive sufficient benefit to change control of Congress. The one candidate who is struggling is the President. The record dissatisfaction with the direction of the country (23% satisfied, 75% dissatisfied) and with the economy and jobs the top issues of concern and the President’s approval of handling the economy at only 36 percent, the President enters his convention and the final quarter of the yearlong campaign still trying to find a secure lead. After a campaign that has been going non-stop for more than a year, the national polling average as the Republican convention enters its third day is one percent in Barack Obama’s favor. Mitt Romney doesn’t need much of a convention bounce. But, it needs to be enough to put him ahead of Obama on September 10, the Monday after the Democrat’s Labor Day convention ends. Gallup reports that some increase in a presidential candidate’s position is expected after their party convention, but that the respective bounces can cancel each other out and the net increase often decays. Obama received a four-point bounce after this successful Democratic convention in 2008, but McCain exceeded it with six points after his Minnesota Convention and introduction of Sarah Palin. Needless to say, the bounce was short-term and collapsed under the weight of the Lehman Brothers bankruptcy on September 15 and Ms. Palin’s poor interview performances. In the two most recent presidential re-elections, the ultimate winners – G.W. Bush in 2004 and Bill Clinton in 1996 – both beat their respective opponents’ convention bounces. John Kerry, in fact, lost ground after his convention (-1%) while Bush gained two points. Bill Clinton gained five points while Bob Dole gained three. Given the continued closeness of this race, a good convention producing a bounce could be the difference. Romney probably has more room to move up, given he is less well-known than the President and has with some doubts to overcome, which Obama and his campaign have worked hard to raise. Numerous voter surveys show Barack Obama leading in Colorado, but in base voter registration, Republicans remain ahead of Democrats by over 100,000 voters, as they have been since the Republican statewide wins in 2010. The chart compares the 2008 and August 2012 voter registrations. In 2008, the final November registration showed Republicans ahead by a mere 10,000 voters. 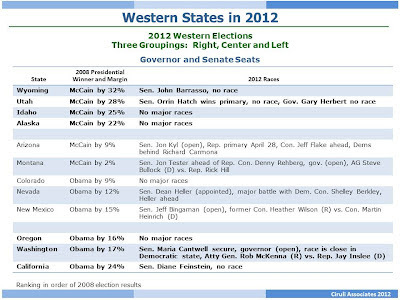 Democrats carried the state for Obama by 9 points and won most other offices handily. But, 2010 was a different year. The Republican registration edge ended up 62,000, as they picked up statewide constitutional offices, two congress seats and the State House. Democrats have been trying to catch up, but even when inactive registered voters are counted (voters who did not participate in the 2010 election and haven’t reactivated their status), Democrats are behind by 31,000 voters. President Obama has nearly moved to Colorado and wins most Colorado polls, yet it is still a very close race. The recent robo poll that has Obama up by three points (Purple Poll, 8-14-12) also demonstrates why the President appears to have hit a ceiling and is unable to break out. Obama is being held back by voters’ negative views on direction of the economy and their evaluation of his performance. Even among Democrats, Obama’s approval rating has considerable leakage and is lower than the percentage of Republicans disapproving. Twelve percent of Democrats are disapproving of Obama’s job performance and another 11 percent say they are undecided. Only two percent of Republicans register any doubt about Obama’s performance, and they are 88 percent to 10 percent convinced he has failed. This could be a product of Democrats concerned about the economy. It could also be liberal Democrats believing he has been insufficiently liberal on some domestic or foreign issues important to them or some of the few conservative Democrats concerned he has moved too far left on class rhetoric or social issue, such as gay rights or immigration. 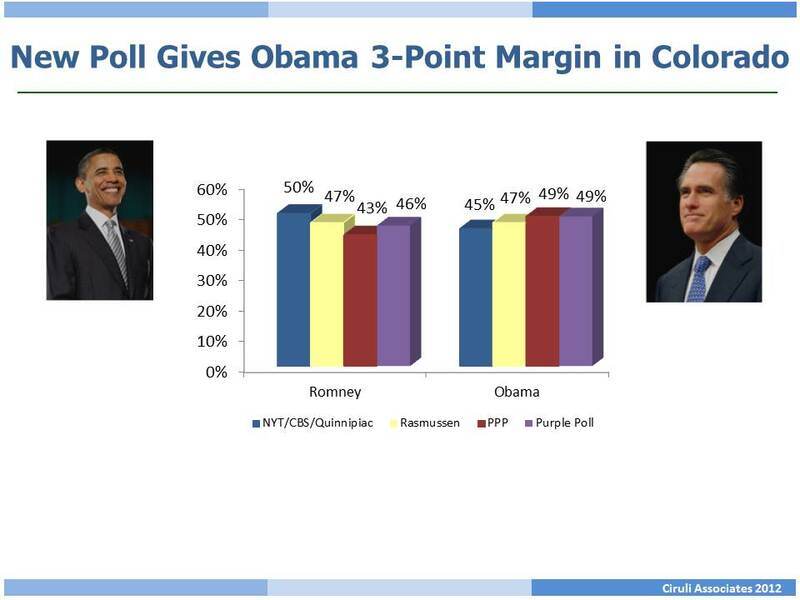 The recent Colorado robo poll (Purple Poll) has the Romney-Ryan ticket beating Obama-Biden by four percentage points among independent voters. President Obama was three points ahead in the poll. President Obama and Mitt Romney tie in their support among their respective partisans, each with a 73-point advantage. Obama is winning two more percentage points of Republicans than Romney is taking of Democrats (13% Republicans for Obama, 11% Democrats for Romney), but more Democrats are undecided as of August 14 (5% Democrat, 2% Republican). Not surprisingly, independent voters are mostly positioned between partisans in their political attitudes. Whereas Democrats approve of Obama’s job performance 76 percent to 10 percent disapprove, and Republicans reverse the order at 10 percent approval to 88 percent disapproval, independent voters position themselves near the middle at 42 percent approval and 48 percent disapproval. They tend to be less decided than most other voters, with 10 percent not sure of Obama’s job approval or a similar 10 percent not able to pick between Obama and Romney. Independent voters are also positioned between Democrats and Republicans on their rating of the direction of the economy, but it still leaves them substantially pessimistic (27% getting better to 41% getting worse). Fox News: Romney 42% to 32%. Obama carried by 8 points in 2008. The latest Purple Poll shows President Obama winning the gender gap by five points (men – 9% Romney, women – 14% Obama). The Obama campaign’s top priority is to use wedge issues to their advantage with Colorado women voters, especially in the suburbs. Wedge issue politics uses hostility toward unpopular or controversial policies targeted at swing voters who have weak attachments to a candidate or party or who are cross-pressured. Democrats have been aiming their “war on women” rhetoric at independent Colorado women or those with weak partisan allegiance. Many of the women are Republican-leaning or concerned about the economy and giving Mitt Romney their early support, but they are pro-choice and moderate on social issues (e.g., gay rights, gun control). Democrats have been using high-profile visits and thousands of dollars of TV to argue Republicans are extreme on abortion and “reproductive rights” (e.g., government subsidizing birth control and other health care benefits). Of course, the Akin controversy is perfect for this strategy. Polling on Proposition 64, the so-called initiative to “regulate marijuana like alcohol,” shows 47 percent voter support in an early August robo poll from PPP. A June Rasmussen poll reported 61 percent support. In a California Field poll earlier this year, only 46 percent of California voters supported legalizing recreational marijuana. A legalization initiative was defeated in California in 2010. A recreational proposal was defeated in Colorado six years after medical marijuana was approved (Proposition 20 passed by 54% in 2000). A key advantage is the amount of money the pro-marijuana force has, most of it out-of-state. More than a million dollars was spent getting it on the ballot and reportedly several hundreds of thousands of dollars of TV advertising time for the fall has been purchased. The Colorado Democratic Party and the NAACP have announced support. 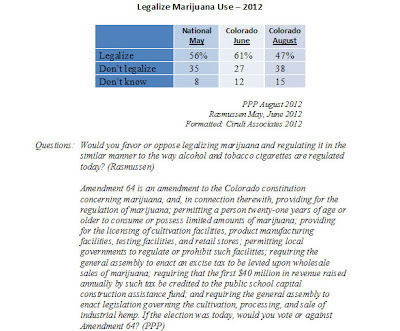 See The Buzz: Will Colorado pass marijuana legalization? 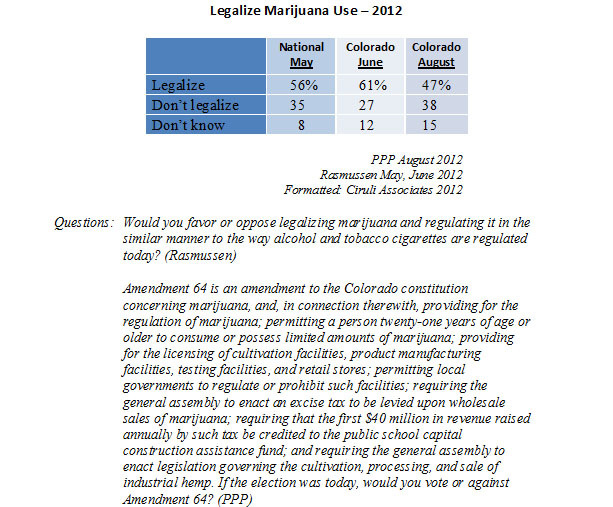 In the latest Colorado poll (Purple Poll, 8-14-12), only five percent of voters claim to be undecided. 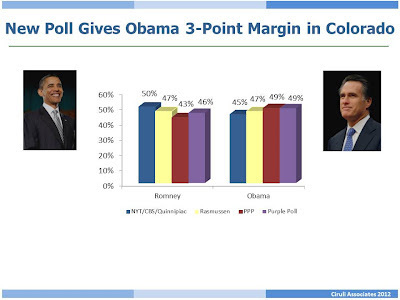 President Obama was ahead in the poll by three points (Obama 49% to Romney 46%). If two million voters turn out in November 2012, only 100,000 are now the target of hundreds of thousands of dollars of campaign advertising and a dozen or more presidential visits before November 6. If 2,400,000 turn out as in 2008, 120,000 voters are now in play. This year’s turnout will be affected by the level of interest in the race, the final registration figures and campaign get-out-the-vote efforts. Given Colorado is a targeted, competitive state with significant TV and grassroots expenditures, a high turnout is expected, in spite of polls showing a slightly lower level of interest in the race compared to 2008. Another four percent of voters claim they could change their minds. The campaigns are targeting both groups of undecided and possible party and candidate defectors. The latest swing state robo poll out of the field August 14, just after the Paul Ryan pick for Republican vice president, has President Obama up by three percentage points in Colorado. 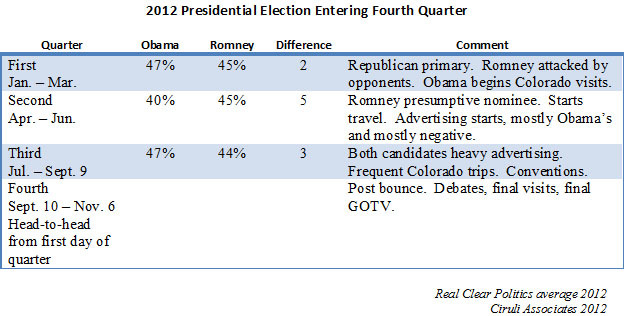 The current average of the four most recent Colorado polls gives the President slightly more than a one-point advantage. The latest poll, Purple Poll, is conducted monthly in the states that are considered in play in this election. Republicans need to pick up four seats to take control of the Senate (or one less if they win the vice presidency), and two of their most competitive races are in the West – Montana and New Mexico. Also, they must hold two seats that will have considerable Democratic competition – Arizona and Nevada. Tiny Montana, one of a handful of states with a single congressional district, has major battles for both senate and governor. Incumbent, first-term Senator Jon Tester will have a tough re-election primarily because President Obama could lose the state by up to 10 points. President Obama campaigned hard here in 2008 and got 47 percent of the vote. The campaign has not targeted the state this year. Tester is a moderate Democrat with more than a million dollar campaign fund in a state with low-cost media. Republican Congressman Denny Rehberg just won a long primary race and should quickly re-fund his bank account with out-of-state contributors. The open seat for governor is considered one of the most competitive in the country. Rick Hill, fresh from a primary win, will be a tough opponent to Democratic Attorney General Steve Bullock. Similar to the Senate, this will be an expensive race for a small state with a lot of out-of-state money. Incumbent Senator Dean Heller has been ahead in polling and appears confident against Las Vegas Representative Shelley Berkley, who is dealing with a House Ethics Committee investigation. Although the Washington senate race appears an easy win for incumbent Democrat Maria Cantwell, races for governors have been close in recent years, and another tight race is expected, with an advantage for the Democrats due to a likely Obama win. Former Democratic Representative Jay Inslee is running neck-to-neck with Rob McKenna, GOP Attorney General. Recent polls have put Inslee ahead, but both candidates are well-funded. Arizona’s late primary (August 28) may yet offer a surprise, but if Jeff Flake wins the race for Republican Senator Jon Kyl’s seat, Republicans will have their strongest candidate. Wil Cardon is Flake’s self-financed opponent. Because of the closeness of this year’s presidential race and President Obama’s tighter funding picture, early talk about targeting Arizona has faded. Democratic candidate Richard Carmona will likely face a difficult pick-up. Democrats want to retain the seat of retiring Senator Jeff Bingaman. The race is between Democratic Representative Martin Heinrich and former Representative Heather Wilson. The polling has been close, as has fundraising. 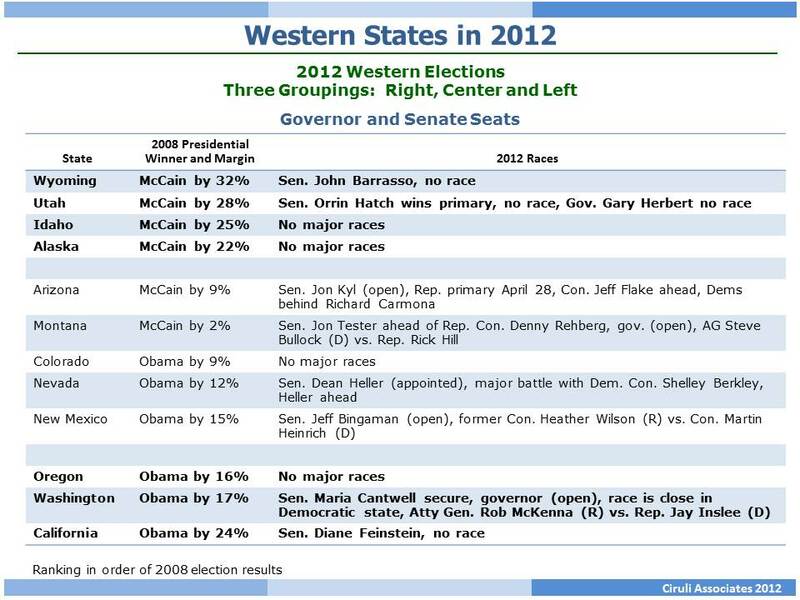 Obama should win the state, helping Heinrich. Colorado may be a battleground presidential state, but it’s not clear the three most contested congressional races are benefiting from the wave of anger that is endangering the incumbents – two Republicans and one Democrat. The latest generic voter test for congressional races show a tie between Republican and Democratic candidates. In 2006 and 2008, Democrats had a more than ten-point advantage, signaling their taking the House in 2006 and adding seats in 2008. 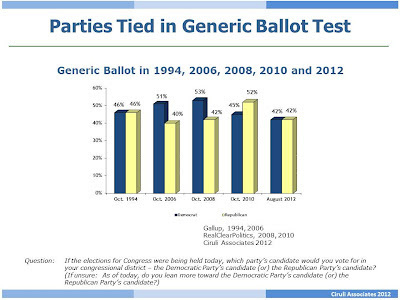 The Republican wave in 2010 had a final seven-point advantage in the generic test. The closeness of generic polling signals that, although Democrats may pick up some seats, they are not likely to sweep 25 needed to take the House unless they win every close election. Democratic strategists James Carville and Stan Greenberg claim to have polling data that shows Democratic candidates benefiting from a surge for Obama and a decline in the image of the Republican brand, including in Colorado. However, Democratic challengers of Republican incumbents Scott Tipton (3rd CD) and Mike Coffman (6th CD) may expect some national money, but little help from the party label, short of an unexpected big win by President Obama. In fact, in the two seats, Obama’s ground troops are welcome, but the candidates have been mostly running independent of the national ticket. Challengers, including Republican Joe Coors in the 7th CD, will have to make their own good fortune. Although vice presidents don’t usually impact a race beyond the initial spate of coverage (Sarah Palin’s negative impact an exception), Paul Ryan’s selection could be a restart for Mitt Romney’s campaign, which was slipping behind due to the relentless negative advertising of the Obama campaign. The economic issue appeared to be insufficient on its own to put Romney ahead. Along with a new voice, appealing life story and enthusiasm, Ryan brings new issues to the table – the deficit, debt, spending and entitlements. Ryan will also jump start the right’s media just as the party heads to their August 27 Tampa convention. “Denver pollster Floyd Ciruli said Ryan's ultra-athletic and outdoors lifestyle is in sync with Coloradans and that part of his background will attract state voters. The Census Bureau has just reported on population growth during the very slow recession period of 2010 and 2011. Denver’s growth rate was larger than any other large western city. As of 2011, the city’s population was 619,968, 7th in the West. Some other Denver metro regional cities that grew faster than average were Broomfield, Castle Rock, Northglenn and Parker. Denver now ranks as the 7th largest western city. And, as reported in The Buzz on July 19, the entire region is doing well. The retail spending recovery continues. The month-over-month from a year ago sales tax receipts in the seven-county region are up 8.4 percent, down slightly from 9.2 percent in May, but still a substantial improvement over last year. Year-to-year compared to last year at this time is also up 8.4 percent. Although Colorado’s presidential race may have gotten closer this last week, with one report that Mitt Romney was ahead by five points, nationally, Barack Obama is building his lead. As reported on August 7 in The Buzz, Obama first received some good polling news from Pew showing that he was up by ten points. Many thought the poll was an outlier. But now, two new polls from Fox News and CNN confirm a growing lead. CNN reports a seven-point spread and Fox News shows nine points. Only Rasmussen has Romney up by 4 points in his daily tracking poll. Polls may be more volatile the next two weeks as the Ryan decision is absorbed and the national conventions are held, but Romney was down by four points on Sunday, the day after the vice president selection was made. 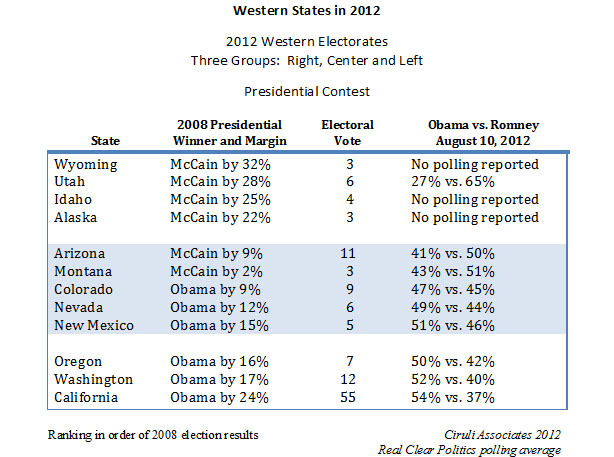 Mitt Romney wins 30 of the Mountain West’s 50 electoral votes using the most recent Real Clear Politics polling average for the nine states. Barack Obama wins 20 and, as of August 10, is awarded Colorado (9), Nevada (6) and New Mexico (5). The race remains volatile. The latest Colorado poll put race at one point in favor of Obama. But, Obama sweeps the 74 electoral votes on the Pacific Coast, with the mother lode of 55 in California, to win the West 94 to 30 in total. 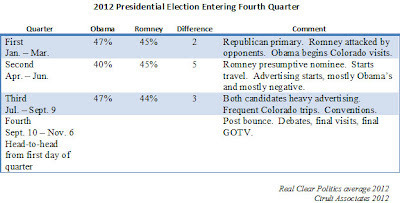 Three new Colorado polls add to the confusion of who’s in front – Barack Obama or Mitt Romney? 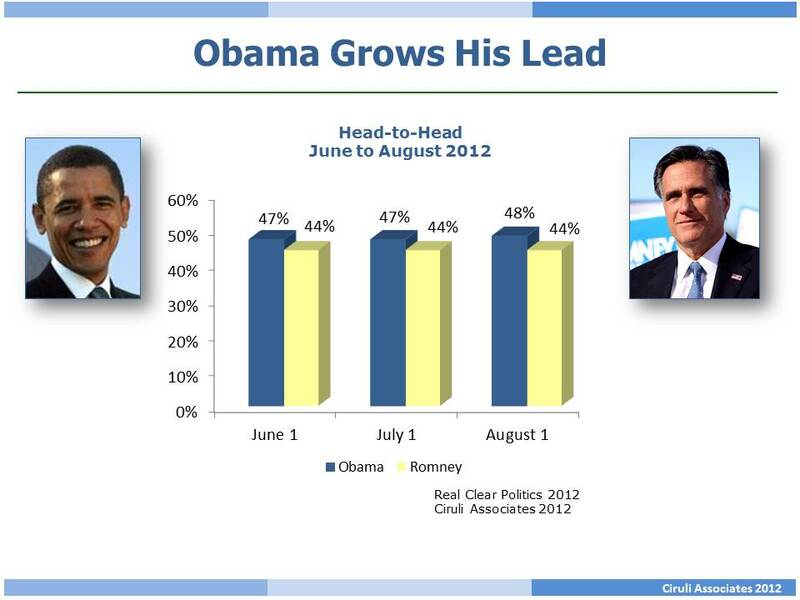 The working assumption has been that Obama had a lead of 2 to 3 points over Romney since January. But, a New York Times/CBS News/Quinnipiac poll places Romney up 5 points. However, two additional polls from Rasmussen and PPP show an 11 point spread, from a tie in Rasmussen to Obama up 6 in PPP. Clearly, Obama is worried and spending two days in Colorado with the Choice ad attacking Romney on economic fairness and a Planned Parenthood ad accompanied by a web video, both claiming Romney is too extreme on reproductive rights. Obama is also using Sandra Fluke to introduce him at a rally targeted at women and independent voters. Colorado has one of the highest percentages of competitive congressional races of any state in the country – 3 out of 7, or 43 percent. That is mostly a reflection of the judiciary having controlled Colorado’s re-districting for two decades and the state being a closely balanced battleground in terms of partisanship. Judges, in creating the new 7th congressional district after the 2000 census and rearranging the lines in the 6th CD after the latest population count, accepted Democratic maps that promoted competition. Democrats have a reasonable chance to pick up the 3rd CD, with Sal Pace running close to incumbent Scott Tipton in terms of raising money. Joe Miklosi in the newly redesigned 6th CD against incumbent Mike Coffman has a district that gave Barack Obama a big win in 2008 and Michael Bennet a slight edge in 2010. But Coffman remains well ahead in fundraising and current partisan registration leans Republican. What on paper looks like a horse race, the 7th CD still hasn’t hit the national radar as competitive. Republican Joe Coors has put a million dollars of his own money into the race and the district is nearly even in party registration. But, incumbent Ed Perlmutter is a prodigious fundraiser and a fierce candidate who has run and won two contested races in the last four years. Is Obama Beginning to Break Away? After three months of a race within two points, has Barack Obama begun to break away from Mitt Romney? 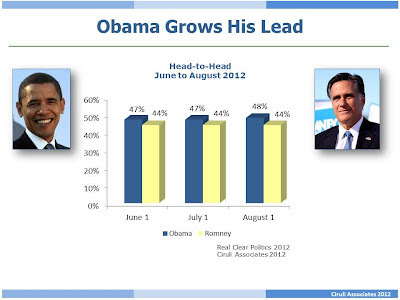 As of the first week of August, a couple of new polls suggest the race is Obama’s beyond the margin of error. A Pew poll of July 16-26 has Obama up by 10 points over Romney (51% to 41%). Pew has had Obama up consistently since January by at least four points. The new Real Clear Politics polling average now has Obama up by 4 percent. Although, independents remain close – 45 percent for Romney and 43 percent for Obama. Romney’s challenge is primarily a high unfavorable image induced by recent Obama negative advertising, but initiated by the Republican primary from January to March (Romney 52% unfavorable; Obama 45% unfavorable). A second poll receiving widespread coverage from the New York Times, CBS and Quinnipiac University shows Obama substantially ahead of Romney in critical swing states of Florida (51% to 45%), Ohio (50% to 44%) and Pennsylvania (53% to 42%). Similar to voters in the Pew poll, the swing state voters appear to be favoring Obama due to his personal appeal and his attacks on Romney’s experience with Bain Capital. Gallup just issued a six-month assessment of Barack Obama’s approval and Colorado remains in the middle of the 50 states and D.C. Obama has a 43 percent approval in Colorado, 23rd from the bottom, which is anchored by our neighbor, Utah, at 26 percent approval. Gallup points out Obama has an approval of 50 percent or above in 13 states and the District. In 16 states his approval was below 40 percent, including our neighbors Montana, Wyoming, Idaho and Utah. Colorado just misses that cut at 43 percent. Obama’s national approval from January to June was 46 percent, still in the danger zone for re-election. Historically, incumbent candidates need to be at 50 percent in the last pre-election poll to be assured re-election, although George W. Bush and Harry Truman won (polling in 1948 was a still new and infrequent business). John Hickenlooper’s buzz quotient went up two weeks ago as he reinforced his nascent national visibility with a performance at the Waldo fire and the July 20th shooting. He has also booked a New Hampshire speech that started the beltway commentariat to speculate about presidential ambitions. To some extent, the early 2016 buzz is a reflection of boredom with the current race, which appears stuck in a two point Obama lead, with 90 more days of browbeating an ever diminishing group of voters. Ironically, Hickenlooper’s separation announcement increased his presidential ambitions buzz. It’s now assumed, with little evidence, but a logic that Helen saw the plan and said this is the time to change her trajectory. Hickenlooper’s next test will be Colorado voters. As Gary Hart, Roy Romer, Bill Owens and others can testify to, the more visible one becomes on the national stage, the more estranged can one’s image become to Colorado’s often demanding and somewhat insular electorate. Is that Solyndra, Fast and Furious, GSA, Congressman Rangel or Citizens United? It’s not clear, but the issue appears to be affecting both candidates’ advocates. Partisans of both candidates rated jobs and corruption. Mitt Romney’s supporters were more likely to prioritize the budget deficit much higher than President Obama’s supporters. Obama’s supporters rated making health care affordable (50% “extremely important”) and improving public schools (48%) as top priorities. Romney’s advocates did not put those items in the top five (21% health care, 27% public schools).